Well, as a believer in experimentation, I thought I’d see what happened when I blended up Fennel Fronds into a Pesto – it’s delicious! If you’re not hugely familiar with Fennel, it has a gorgeous, liquorice flavour. Into the blender, throw a few strips of the fennel bulb (about 1/4 of the bulb – save the rest for a nice salad) a handful of cashew nuts, a squeeze of Lemon Juice, 1 clove of crushed garlic, all the fennel fronds (those green things) and a little Extra Virgin Olive Oil. Blend! Add a little more oil, blend some more – it’s not an exact science. 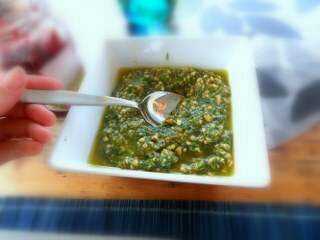 Keep tasting until it’s a nice, pesto consistency. As you can see, I threw in a few basil leaves as I really do adore basil!